In December 2018, Kairos Palestine hosted their 9th Anniversary Conference at the Dar Annadwa International Center of Bethlehem. With the theme of “Hope where there is no Hope,” the gathering looked back at the past nine years since the Kairos Palestine document (Full title: “A moment of truth: A word of faith, hope, and love from the heart of Palestinian suffering” ) was first launched by Palestinians Christians in 2009. The gathering also provided an opportunity for conversation, strategizing, and collective action for just peace in the region and the end to the Israeli occupation. 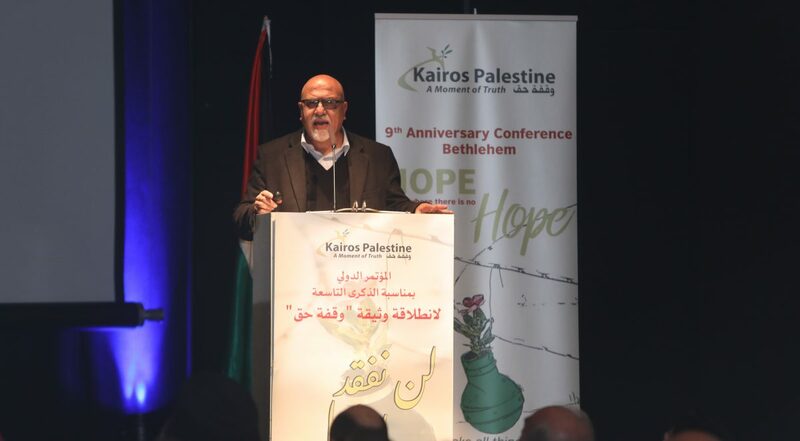 In this month’s “Voices from the South,” we feature excerpts of the opening speech of the conference from Kairos Palestine’s coordinator, Rifat Kassis. In his speech, Rifat addresses the main challenges for Palestinian Christians today, the way ahead for global solidarity and nonviolent resistance, signs of hope, and concrete aims of the “Global Kairos for Justice” movement. I am here not to report on Kairos and its work because Kairos is not an institution or an organization or even a coalition. Kairos is us! It is the vision of the Christians in Palestine for their reality and their future in this land. It is a Christian Voice unifying people and not competing with anyone as it is “all, from all and to all”. It is the discourse of the Churches, the church related organizations (CROs) and every single individual who cares about his/her Christianity and homeland. Kairos is a social movement and part of the Palestinian liberation movement and struggle for its dignity and for self determination. It is a Christian creative resistance movement. From even before we launched the document, the group of those of us who sat to write it up grappled with images, and ways, to carry forward our hopes and to demonstrate our faith. We can claim a growth in our movement to carry it even further – a process that is gaining momentum even as I speak. We are reaching villages and communities through town hall meetings and community encounters. And we also derive energy from the multiple expansion of global solidarity. Our conviction is that when local resistance and global solidarity merge, ours is a winning formula. Kairos Palestine is now a global solidarity movement still in formation, but seeking to grow. At the conclusion of this conference, members of what he have called “Global Kairos for Justice” will work together to develop a Global strategy of solidarity – a tangible and comprehensive plan of action for Kairos partners around the world to work with. The legitimization of the settlements and settling. Weakness of mainstream churches, its ecumenical bodies to raise their voice and speak up. Palestinians everywhere are uniting! More connections between the Palestinian people which are scattered in different areas. The popular resistance and more youth movement and participation in the struggle than in any time before. This you see in Iblin, Nabi Mousa, and the Great March for the Right of Return in Gaza and in many other places. The gradual shift from the apathy of the official States to the concerned Civil Society. For ages this conflict was addressed by states and/or multi- state actors with no solution, today the civil society is taking an increased roles replacing the role of the states. The Boycott, Divest, Sanction (BDS) movement, Kairos movement and the many other global, regional and national initiatives had grown and posing real challenges to Israel and its allies by working for justice to Palestine and the Palestinians. The gradual international public opinion shift from dealing with Israel as a “democracy” to Apartheid. Where is Kairos Palestine today? Through my sharing of thoughts, I hope to prompt us to address ourselves as Palestinians and as a global community. They are not my personal hopes and goals. It is what we as a collective Palestinian people look forward to as camaraderie between us and also from the international community. Strengthen the Christian presence thorough continuing the gatherings and meeting with Christian leaders and community in Palestine…to know more about their difficulties and how to respond. Preserving the Christians presence is not a sectoral issue but a national one as to keep the fabric of the society and the pluralism. Work with other components of the society. Gaza is an example as they now have a Muslim movement to support the Kairos movement. Nablus and the work there is another example working with Muslims and Samaritans. Writing and launching the book “Introduction to Palestinian theology” and launch it in more areas…the launch in Al Najah university was a milestone as it is the biggest university and mainly Muslims student study there. Work in partnership with “Christ at the Checkpoint” to challenge the evangelical Christians. Keep our national work and preserve the national Christian voice and support all initiatives. Strengthen the BDS and Boycott the pro-Apartheid churches and theologians. Rifat Odeh Kassis is a Palestinian Christian who was born in Beit Sahour, in the West Bank. An active human rights and political and community activist. He is an author and speaker. He has been arrested and imprisoned several times by Israel. He is a co-aouther of the Kairos Palestine document and its Coordinator since its inception.